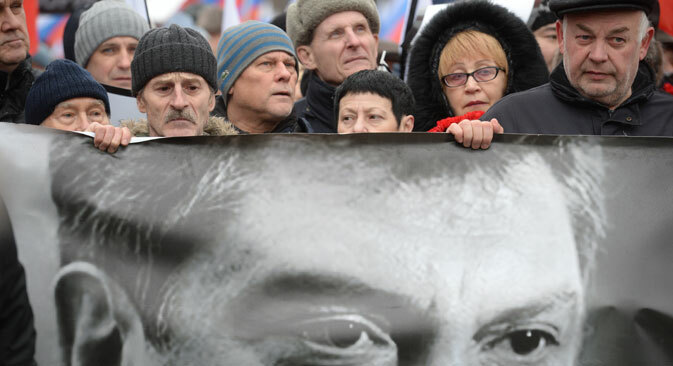 The European Parliament passed a resolution on the murder of Boris Nemtsov and the state of democracy in Russia on March 12. The European Parliament on Thursday passed a resolution on the murder of Boris Nemtsov and the state of democracy in Russia. In the resolution, the parliament called the Nemtsov killing "the most significant political murder in recent Russian history" and demanded an unbiased international inquiry into the crime. The MEPs also expressed their disappointment that some diplomats who wished to attend Nemtsov’s funeral were refused entry to Russia. In the resolution, the MEPs say Russia is moving in a direction "contrary to a functioning democracy" and urge the Kremlin to stop "all pressure, repressive acts and intimidation" against opposition leaders, civil society and media and to release political prisoners such as Ukrainian pilot Nadezhda Savchenko. The European Parliament has requested an independent international investigation into the murder and notes that the instruments available within the framework of the OSCE, the Council of Europe and the United Nations would help to ensure an impartial and fair investigation. Representatives of the Federation Council, the upper house of Russia’s parliament have called the resolution politically motivated. "This decision by European parliamentarians is entirely political, not legal, and by definition will have no consequences from the viewpoint of an objective and effective inquiry into the murder of Boris Nemtsov," Konstantin Kosachev, head of the Russian senate's International Affairs Committee, told Interfax. Whatever needs to be done is being done by Russian investigators, he said. "And the task of politicians, both in Russia and abroad, is to provide all necessary conditions for the inquiry to continue without impediment and outside pressure," Kosachev said. Leonid Kalashnikov, the First Deputy Chairman of the State Duma International Affairs Committee said that such resolutions do not deserve a reaction. "Let them look into the murder of John Kennedy, do not interfere with others' business and stop fooling around," Kalashnikov told Interfax. "Political assassinations and criminal offenses happen in any country," he said, "terror attacks in Belarus; they were wailing about explosions in the metro and claiming that the presidential administration was behind that [crime] and when the perpetrators were found, they were wailing that they [the criminals] could not be executed." Kalashnikov said one should not be surprised at such resolutions. "We should stay calm and make no excuses," he said. The family, friends and associates of Boris Nemtsov gathered on March 3 for the funeral of the murdered politician and Kremlin critic, gunned down in central Moscow on the evening of Feb. 27 by unknown assailants. Among those who attended the burial was Nemtsov’s former colleague Irina Khakamada, who pays tribute here to a man who always stood out from the crowd in the world of Russian politics.